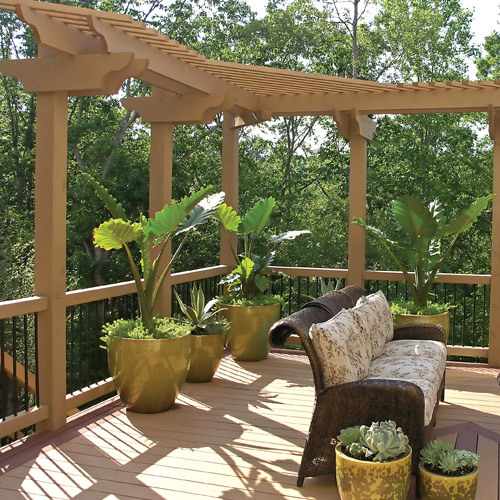 When you are planning to build a deck, there are lots of details that are helpful to decide before you get started. When you are planning to build a deck there are lots of details that are helpful to get settled before you get started. It is always a good idea to measure out with rope or a tape measure the size of deck you are thinking of adding to your house. What might look like a reasonable size on the deck design program may look too small or large next to your home. Sometimes there are hills or trees or other issues to deal with as well. By measuring out the area in your yard, you discover them well ahead of when you get a load of framing lumber and decking material for exterior use. Obviously, higher decks mean longer support posts. What it can also mean is that you need to use thicker posts to support your deck if it's high enough off of the ground. 4 x 4's are not always the post to use, and are often not even allowed by building codes for decks over a certain height. If you plan on 4 x 4's, but are required to use 6 x 6's, your deck budget might not be as flexible as you want it to be. If your deck is only one step off of the ground, you may not need to have a rialing at all. But if it's much higher, you will need a railing, both for safety and for meeting building codes. The size of the railing may vary a little also with height. The height and plan of your stairs also depend rather heavily on the deck height. Will the stairs be a straight run up to the deck, or will you turn a corner? What sort of support posts will the stairs need? How many stairs will there be for that height? [Hint: a normal rise per step is around 7 inches. 1. The natural products tend to be less expensive, but require maintenance. 2. Man-made products are more expensive, but tend to be relatively maintenance-free. How you like the appearance of each is entirely up to you. We stock Pressure Treated, Cedar, and Mahogany in natural products, and Trex, Procell, or Epoch in the man-made products. We also can order for you all sorts of different brands and profiles in from other decking companies. There are three basic choices for size of decking. This is the older style deck with large, heavy planks as the surface. They are still used occasionally for new decks, but not often. This means that much of the 2x6 stock is probably going to be framing grade rather than appearance grade. We do stock a pressure treated 2x6, though it is a framing grade. This is important to decide whether you are choosing a natural wood or a composite decking product. Each sort of decking has its own coloring characteristics, both when it is new, and after it has had a chance to weather and age. If you opt for a natural wood product, you should also consider what sort of protective coating you might want to apply to it, so that you may enjoy your deck for many years to come. Some woods take semi-transparent or solid stain better than others. Some woods look best with a simple clear coat of oil. If you choose a wood that does not have any natural protection against the elements, then you may even wish to choose an exterior deck paint. If you choose a composite decking product, then the colors available may directly influence your choice. Keep in mind that most products to change color somewhat over time, as they are exposed to the sun and the elements. Some products, like the natural Trex are designed to fade to a silver gray, even though they start off as a light brown color. Other product lines are engineered to fade only a little in the sun, and so maintain most of their color. Still others may accept a coat of paint, in which case the choices of color are almost limitless. This is the most affordable rail system, at least at first. Pressure treated does not cost a lot up front, but you need to maintain it, just like any other natural material. If your decking is pressure treated also, a pressure treated railing will stain to a similar color, thus making it easier to match the rest of your deck. This wood is very close-grained, hard, yet light in weight. The color ranges from soft yellow to almost white. We carry knotty grade with S4S profile and 3/8" radius edge. "Maintenance free" products are becoming more common as time passes. Deck railing systems are not being left behind in this. We have available to us three different brands of low maintenance rail systems. They are more expensive in the short term, but the maintenance is lower, and the materials are supposed to be more stable - which means less cracking and checking.